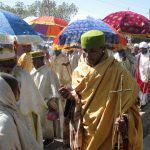 When my husband Noel told a colleague that we were going to Ethiopia, she replied, “Ah, the motherland.” Visiting Ethiopia is like being in a time machine. We traveled back a hundred thousand years or more to our hominid origins with Lucy, forward 50-60,000 years to our tribal and pastoral roots, forward again several score of millennia to the time of Solomon and Sheba, fast forwarded to the very earliest forms of Christianity, past stone walled towns and terraced agriculture and finally touched down once again in the 21st Century with the global economy advancing full blast. Visiting Ethiopia was a breath-taking experience. 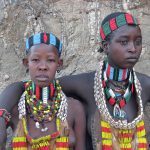 We decided on a trip to Ethiopia when I saw the Omo Valley listed as a destination in an expedition catalog from National Geographic. 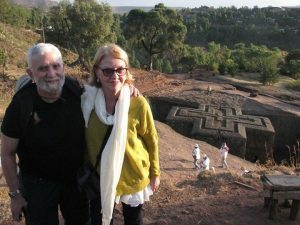 The tour also included Lalibela, but it was the Omo Valley that attracted me. 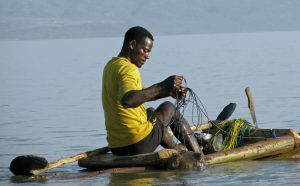 The Omo Valley has been home to several pastoralist groups for thousands of years, but their distinctive ways of life are changing rapidly because the central government in Addis Ababa is pushing the development of industrial agriculture in the region and building a massive hydroelectric dam on the Omo River. Pastoralists are nomadic people who support themselves by raising livestock on uncultivated pastures and supplement their living by practicing flood-retreat and rain-fed bush-land agriculture. What we were privileged to see will probably not exist in ten years, so there was an urgency on our part to get there before it all went away. We began our journey on Ethiopian Airlines. It is a great airline with a really fine business class and no first class. If possible, it’s always good to fly the carrier of the country that you are visiting. You can get a good introduction that way. We made the mistake of flying United Airlines to Turkey two years ago. It was terrible, bad food, bad service (even in business class) and old airplanes. I honestly don’t know why anyone who has a choice flies United or American. On Ethiopian Airlines we were served some really good Rift Valley syrah and merlot wines. We passed on the western entrée and opted for a selection of Ethiopian wot (vegetable and meat stews, often quite spicy) accompanied by injera bread (a flat, spongy sourdough bread, made of fermented teff flour). 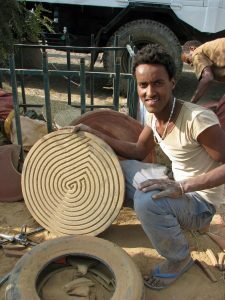 I’m not a fan of sourdough, but injera works with well with spicy wot. We ended our dinner with fabulous Ethiopian coffee. We would learn more about this wonderful beverage later on our voyage. After fourteen hours of flying we landed in Addis Ababa, purchased our visitors’ visas at the airport and met our three National Geographic hosts – professional photographer Chris Rainier, J. D. Kling, the logistics person, and Henok Kebebe, our Ethiopian guide. I should mention that this was a photographic expedition. We are not professional photographers or even serious amateurs but we chose the photographic expedition because of the timing. There was a cultural tour that ended the day we arrived, but the timing was too close to the Christmas holidays for us. Getting acquainted with Chris Rainier was a real privilege. He was Ansel Adams’ last assistant from 1980 to 1984 when Adams died and spent the year after his death printing his undeveloped negatives. Chris is considered one of the world’s leading documentary photographers. 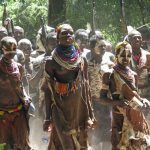 Although he has covered conflicts in political hot spots like Sarajevo and Somalia for publications like Time Magazine, he sees his life’s mission as helping to empower indigenous people by showing them how to use photography and technology to record and enrich their cultures. Our tour group consisted of 21 people including our three hosts. We were mostly in our late 50’s to early 70’s. Most everyone was in decent physical shape, but accommodations were made for those who had difficulty walking. Noel and I and a couple of spouses were the only non-serious photographers. I just shoot to illustrate my blog. Everyone else was very earnest about their photography and Chris was very generous with his time and advice. 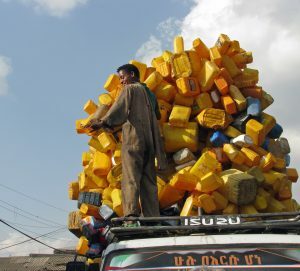 My first impression of Addis was of a dynamic city under construction. It stands 7000 feet above sea level and has a population of over 3 million. High rise buildings seem to be going up everywhere. 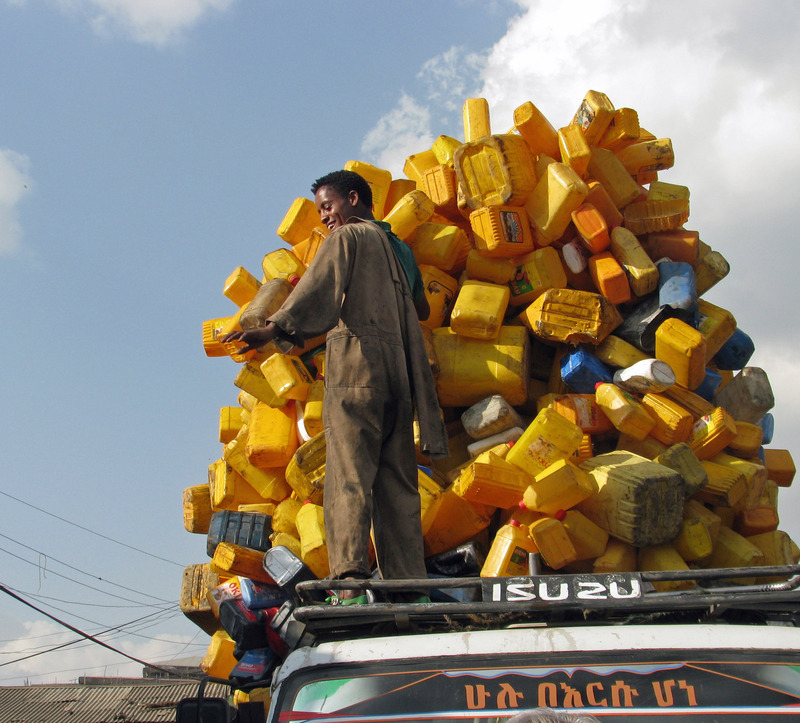 Ethiopia has the fastest growing economy in Africa and the African Union is headquartered in Addis. The city has been called the political capital of Africa. The Chinese are close to completing the construction of a light rail system in the city. The name Addis Ababa means “beautiful flower” in Amharic. It is not an old city. It was founded in 1886 by the Empress Taytul Betu, the wife of Emperor Menelik II. She apparently liked the hot springs there. Security seems to be an issue because we had to pass through airport-like screenings to enter our hotel, the Radisson Blu. But given the fact that Ethiopia borders Eritrea, Somalia and Sudan, it’s not surprising. In the afternoon after our arrival we went to the Merkato, the largest open-air market in Africa. The market was set up by the Italian fascists during their occupation of Ethiopia in the 1930’s. They forced non-European merchants out of the center of the city into the Merkato, at the time located on the outskirts of the city. It can be an overwhelming place, but it does seem to be organized by category. In other words, knives are generally located in one area, baskets in another, fabric in another, etc. We were warned to be extra cautious about pickpockets. Day two began with a tour of the National Museum where the famous skeleton of Lucy is located. 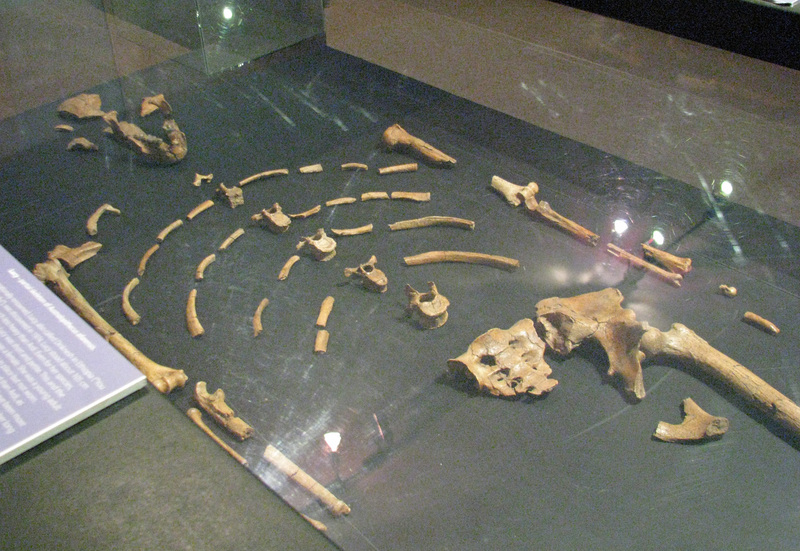 The real partial skeleton of Lucy is not on view, only an excellent copy, but the displays of the early evolution of hominids and ultimately homo sapiens and the animals and tools that accompanied them are impressive. After leaving the museum we had a short flight to Arba Minch, a small city about 300 miles south of Addis in the Great Rift Valley. The airport at Arba Minch has the dubious distinction of hosting an American drone base. The high-tech hanger is clearly visible when you get off the plane. Chris told us he had actually seen a drone take off from there, most likely tracking Al Shabaab in Somalia. 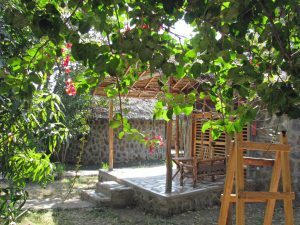 Our lodging for the night was Paradise Lodge with its traditional tukul cottages (thatched huts) and a sensational terrace that overlooks the Rift Valley. After lunch that included some really good fried lake fish caught locally, we boarded some small boats and toured Lake Chamo to view its animal life. The lake is teeming with crocodiles, hippos and amazing birds. We saw a large flock of pelicans that are much bigger than the domestic ones we have. I didn’t realize pelicans gathered in such flocks. I always thought of them as freelancers. One of the most interesting sights was that of local fishermen checking their nets from their homemade rafts surrounded by menacing crocs and hippos. As we were getting out of the boats, Henock pointed out some trees that had rattan bee hives hanging in their crowns. 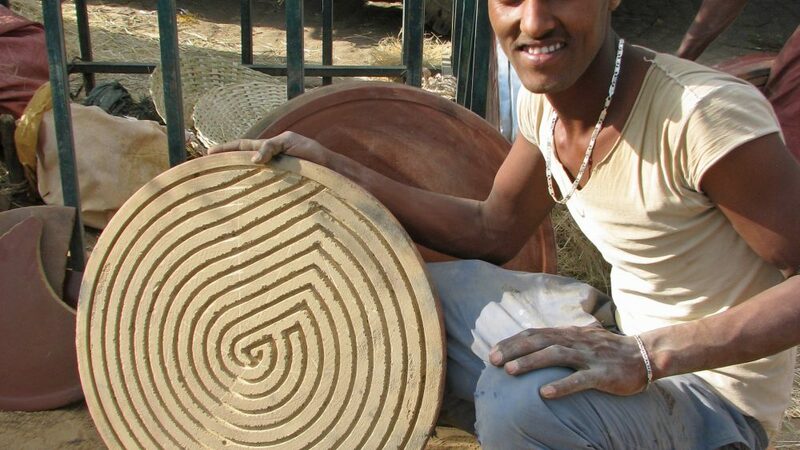 Honey is an important food source all over Ethiopia. Before we left the next morning, we had the opportunity to shop at a small boutique attached to the hotel that offers local crafts made by two nearby workers’ co-ops. The textiles are particularly nice.